Sorry for the delay in posting. It takes time to travel places when on vacation, time to visit them, time to drive back home, time to unpack and time to reestablish some normalcy at home. The latter won’t happen until Tuesday when our refrigerator will be repaired. It died on us during our 12-day vacation. In 2009, I got a free business trip to Cape Cod, more specifically to Woods Hole on the cape’s south end. I liked what I saw of Woods Hole and Falmouth to its north. My wife had never been to the cape, so it seemed like a good way station on our way back home. We drove from the Acadia National Park in Maine to Falmouth on Tuesday, a rather monotonous drive mostly along I-95. The most direct way to the cape for us was through Boston. The Big Dig under Boston Harbor was supposedly to relieve the traffic congestion. Considering what we endured about 3 PM on a Tuesday, it must have been even more hellish before the Big Dig. Congestion in downtown Boston added about an hour to our trip. Falmouth though remains charming, just less so in the height of tourist season. Parking downtown is hard to find this time of year but we managed to find some parking not too far from The Quarterdeck, a restaurant like most in the area specializing in seafood. The Quarterdeck is built to look a bit like an old sailing ship, although you won’t mistake it for a real quarterdeck. Some of the wood used in construction though reputedly came from ships constructed in the 16th century. So in that sense it’s historic, and the food was as good and pricey as I remembered it. What were missing were the regulars at the bar. I guess there were too many tourists this time of year for them to bother. So perhaps Falmouth is best enjoyed outside the tourist season. Our Wednesday destination was Martha’s Vineyard, an island off the coast of Massachusetts known as the playground for the rich and famous. In fact, it was very much in the news on Wednesday because President Obama was vacationing on the island. In addition, Hillary Clinton was visiting. This plus frequent squalls and high winds kept the skies cloudy, the winds brisk and the pavement mostly dancing with raindrops. It was the only mostly rainy day of our vacation, so we didn’t complain much. Getting to the island though is a hassle. You can’t just drive to Woods Hole and catch a ferry. There is virtually no place to park there, so you park in lots near and around Falmouth instead, and pay $13 a day for the privilege, plus you purchase ferry tickets modestly priced at $8 a trip. It is technically possible to take your car to the island, but this time of year it requires making reservations months in advance. It didn’t bother us too much because the bus system is decent and it costs only $7 for a day pass anywhere on the island. What did bother us were the weather and the traffic congestion it caused. Ferries normally dock at three different ports, but due to high seas from the rain and wind they all went into Vineyard Haven instead, which clogged the roads as people had to redirect to it. Having the president and former secretary of state on the island probably didn’t help either. So we spent much of the afternoon in the rain on a bus stuck in traffic, or waiting at a bus shelter in Edgartown. We needed our stiff umbrellas but there was not much we could do or see in Edgartown. Buses were not arriving on time. It looked like we should just head back to Vineyard Haven and go back to our hotel. For a change though my wife was the one with more wanderlust, so she persuaded me to wait for the series of buses that took us to the far western side of the island, known as Aquinnah. Near the tip is Gay Head and its “painted” cliffs which were breathtaking. We also got a break from the rain by the time we arrived around 4 PM. It was more than the cliffs that was invigorating: it was also the stiff, moist breeze and the shimmer of a partially obscured sun on the water. As for the Vineyard itself, if you go through the hassle of getting there you can understand its appeal. First, it is viney. I did not see any grape vines, but it is a lushly green island with many bumps in elevation that don’t quite qualify as hills. Second, it’s an island so it is not easily accessible, thus it feels both cut off and safe. Third, it’s obvious that mostly those with money live on the island. Towns like Edgartown are full of Gingerbread houses, most of which look rented out, surrounded by downtowns full of mostly one of a kind stores and curiosity shops. And of course there are pricey houses, many on bluffs with huge yards that resemble plantations, and President Obama and family were likely on one of them. Prices were roughly fifty percent higher than on the mainland as well. We didn’t even try to rent a hotel room there. We might have been able to rent one if we had $300 or more a night to drop there. It was less than half of that for our hotel on Falmouth. The island also has beaches, but also lakes, seawalls and an airport. So in spite of the weather, it was worth going to. Simply the view of the sea from Gay Head justified the time and expense. And that was pretty much our vacation, sans a very long, traffic-clogged trip home on Thursday and the discovery that someone had broken into our house while we were gone, someone who clearly had a house key, which made the burglary more curious as only three people we trust have a house key. No doors were busted in. Only some jewelry was taken which had more sentimental than monetary value, but it was a loss nonetheless. It must have happened in the late evening after my daughter had gone to work (she works nights). Police were called, dust prints from a hand were found on our comforter and our dresser drawers were ruffled through. We’ve never had an incident like this before, and it’s more than a little creepy. The locks will be changed on Monday. Now my retirement starts in earnest. On Friday morning, I had to go to the store to pick up a few essentials for breakfast. I watched a long parade of cars go by our street, likely mostly working people off to a 9 to 5 job. Not me. Now I am just a guy with a busted refrigerator, a looted house and a lot of bills to pay. But hey, I’m retired! During the summer of 2008, my family took a roadtrip to Beantown, stopping along the way at artsy places like Mount Gretna, Pennsylvania and lowlife way stations like the Ghosthunters show storefront in beautiful (well, actually kind of ugly) downtown Warwick, Rhode Island. This week I finally had a reason to fly into Beantown, a.k.a. Boston, Massachusetts. Beantown turned out to be a way station to my real destination, the Woods Hole Oceanographic Institute in Woods Hole, Massachusetts, which sits on the southern side of Cape Cod. There I spent three days in a lovely conference room and spent my evenings wandering around Woods Hole and nearby Falmouth. The Woods Hole Oceanographic Institute sits in what is probably the most bucolic campus in the country, with dozens of lovely building surrounded by maple and oak trees, joined by lovely walkways and with the Atlantic Ocean just a fifteen minute walk away. As I told my daughter, I enjoy my short distance business trips the best. The shortest ones generally occur in my own time zone, and I can get there with a direct flight, generally lasting an hour or so. Getting there does not swallow most of my day. As it turned out, it took longer to drive between Boston’s Logan airport and Falmouth (where we stayed) than it did to fly between Washington Dulles and Boston. There were no weather or aircraft delays, just routine traffic delays trying to drive out of Boston during rush hour. Cape Cod is further away from Boston than I thought. I imagined you could glimpse it from Boston Harbor but I doubt that is true, at least not at surface level. It is further east and further south than I imagined. Falmouth, where we stayed, turned out to be a lovely and typical New England town with plenty of stores, galleries and restaurants designed mostly for tourist season. In October, while the tourist traffic was somewhat off, the locals were friendly, looked well moneyed and were overwhelmingly white. The citizens of this part of Massachusetts are an unfailingly polite group, or so it appeared to this visitor. A walk down the Shining Sea Bike Path into Woods Hole led to many pleasant greetings from fellow residents. Woods Hole is small and exclusive enough to make it nigh impossible to park without a permit. It is also a harbor town. 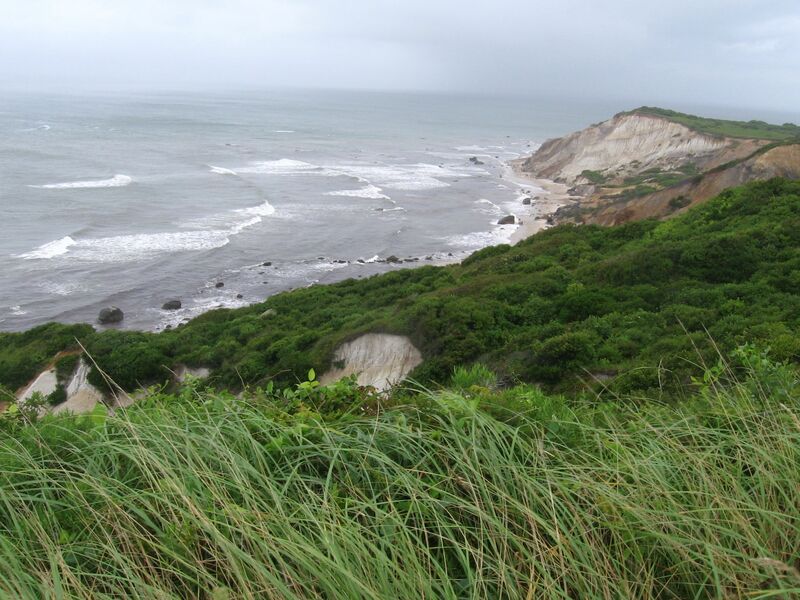 Aside from serving oceanographic interests, it acts as a conduit for tourists to and residents of Martha’s Vineyard. For $7.50 you can board a ferry that will deposit you on the island. Make sure you also purchase a return trip and not miss the 9:30 PM ferry, or you may be in for a long and cold night. Particularly during the summer season, without a reservation you cannot count on a room at Martha’s Vineyard. I looked hard to find things to dislike about this part of Cape Cod. Most towns in New England come complete with a picturesque town square or commons, which offer a lovely dose of tamed nature in what would otherwise be a busy part of town. In Falmouth, my group found plenty of old churches, meeting halls and restaurants. Dinner at The Quarterdeck in Falmouth revealed a tavern populated not by tourists but by locals, all of whom seemed to be on intimate terms with each other. There was not a hint of crime or litter in Falmouth. Nor could I complain that the town felt fake. Steeped in hundreds of years of history, it cannot help but be authentic. Nor, after walking its long main street, I could I find a chain restaurant, a real plus. If you do not enjoy seafood, you would probably be happier elsewhere, but if you do enjoy seafood you are blessed with abundant and fresh seafood at local restaurants, which you can watch being hauled in at harbors like Woods Hole. If forced to find items to complain about, one could make the case that the local roundabouts found on the Cape as well as much of New England, while quaint, are annoying and create backups at certain parts of the day. I also checked the local real estate prices. The riff raff are apparently easy to keep away because they cannot afford to live in this area. It helps to inherit a relative’s property or to have a six figure income. Otherwise you probably cannot afford to live in this area, despite its conspicuous absence of supersized houses. This second trip to New England in less than two years made me realize again that New England is loudly calling for me to settle there. Fortunately, it is also calling my wife, which means we will be looking at retiring, if not in some charming Cape Cod town like Falmouth, then somewhere in New England, providing we can afford it. While there are definitely some not so nice areas of New England (such as Revere, where Logan Airport sits) much of it is charming and inviting to those who like a northern climate. I imagine New England gets much less charming in the winter, particularly during its abundant snow season. I suspect much of its charm would wear off after shoveling snow several times a week. Most people retire from places like Boston, not to these places. I may find that the milder climate of Northern Virginia where we now live is much better overall. Still, now that I have an exposure to New England, I want to live here. It will be hard to convince myself to spend my retired years somewhere else.